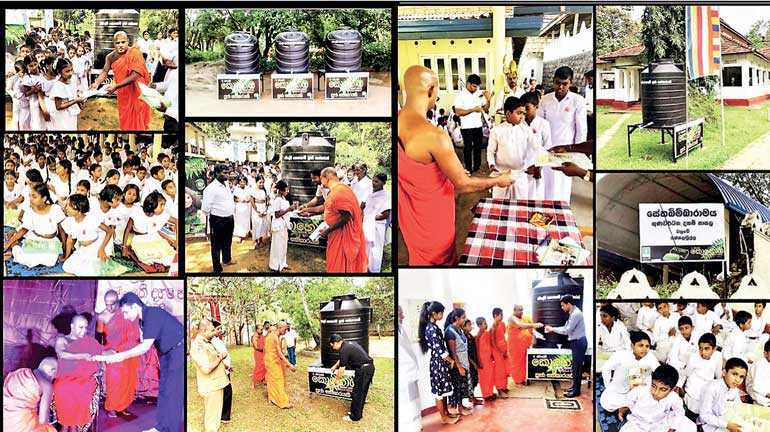 The Swadeshi Industrial Works PLC, the manufacturer of Khomba herbal soap, donates water tanks for communities all over Sri Lanka and books to schools regarding good values. This CSR project continues under the ‘Swadeshi Khomba Herbal Soap’ brand. Swadeshi recently donated water tanks and books to rural villages all over the island. A spokesperson of Swadeshi said that as a Sri Lankan-owned company, they consider it a duty to help the communities in the rural areas in Sri Lanka to raise a healthier younger generation. Getting safe water for drinking in schools is a big problem in dry zone areas in Sri Lanka. During the driest times of the year, children are having health issues by not consuming sufficient water during the day. Communities suffer many difficulties and hardships due to this. “At Swadeshi we think this is our own social responsibility and we are hoping to continue this project in years to come,” she added. It’s another ‘Swadeshi Khomba Puja Sathkaraya’ project which gives safe water for hundreds of students and teachers. “We also have printed a book for school kids briefing good values and habits and at this moment of time cultivating good values and habits in the country is a must,” she added. Swadeshi Khomba also annually illuminates country’s most famous temples under the theme ‘Swadeshi Khomba Aloka Puja Sathkaraya’. “As a Sri Lankan-owned company, we consider it a duty to safeguard the culture and traditional heritage of Sri Lanka by supporting activities such as Aloka Poojawa,” she said. She explained that Swadeshi illuminates places of worship in the country for the benefit of all worshippers and also to educate the younger generation on the importance of safeguarding the country’s heritage. Swadeshi supports the Aloka Poojas of Kataragama Kiri Wehera, Ruhunu Kataragama Maha Devalaya, Devundara Uthpalawarna Vishnu Devalaya, Redeegama Ridee Viharaya, Rathnapura Maha Saman Devalaya, Dambadeniya Raja Maha Viharaya and Keragala Raja Maha Viharaya annually. The Swadeshi Industrial Works utilises its state-of-the-art facilities and modern research and development and manufacturing methodologies to innovate and bring new herbal personal care products to the market that delight the refined tastes of its customers. This emphasis is evident by the company’s investment in R&D. The company boasts of cutting edge technology laboratories and its processes have been certified to ISO 9001 – 2015 standard by the Sri Lanka Standards Institution (SLSI). Eight decades in soap manufacturing industry Swadeshi maintains the herbal personal specialist role in Sri Lankan soap industry. “We at Swadeshi maintain the highest quality standard of our products and manufacture reputed brands like Khomba, Rani Sandalwood, Khomba Baby, Apsara, Perlwite, Lak Bar, Lady, Black Eagle and Little Princess for over 78 years. It’s a struggle everyday for survival with increasing taxes, raw materials prices. Local manufacturing industries are facing difficulties with high cost of manufacturing. However, we shall believe in giving our customers the best of quality and helping our communities in the country. As a local manufacture we are always ready to put back what we earn to help our communities and we will continue to do this and we will keep on improving the life of our communities in our motherland,” she added. Swadeshi has brought trusted best quality personal care products from nature for you to enjoy, since 1941 and all Swadeshi products are 100% cruelty free – not tested on animals and 100% vegetarian.